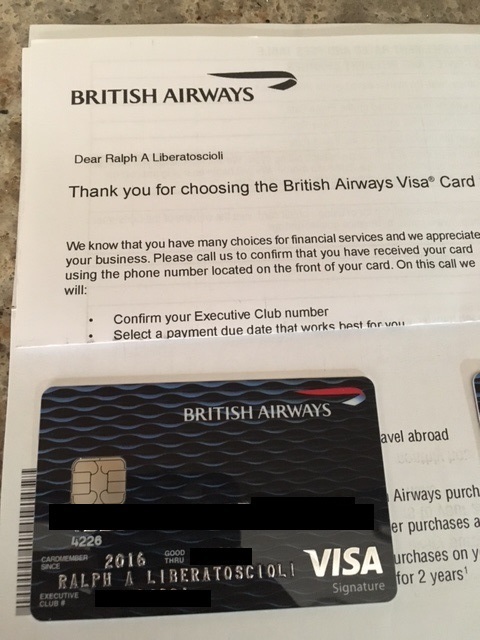 While the signup bonus on the personal Bank of America Alaska card increased to 30,000 miles a few weeks ago (remember it is available with a $100 statement credit via this direct link), the business version of this card was still stuck with a signup bonus of 25,000 miles. However, I just noticed the signup bonus on the business version of the Alaska card has increased to 30,000 miles if you spend $1,000 in 3 months. The annual fee of $75 is NOT waived in this offer. This change must have occurred yesterday as I just posted about my recent app-o-rama in which I applied for this card with only a 25,000 mile bonus and when checking the current offer for that post, it was still just 25,000 miles as of yesterday. I imagine this will be the new standard offer going forward and this card, along with others at Bank of America, are pretty churnable. My strategy would be to apply for 1 personal and 1 business card at a time so the credit inquires are combined. 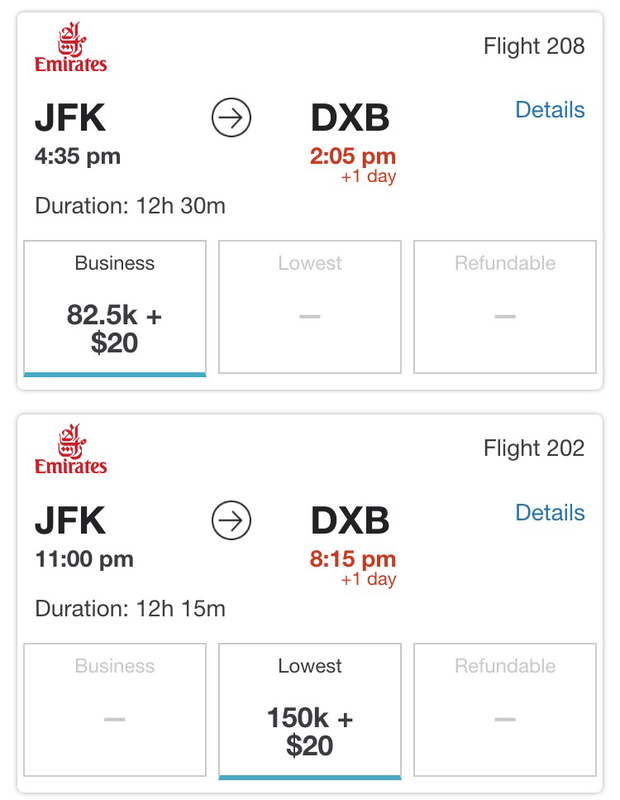 This would result in an easy 60,000 Alaska miles for a net cost of $50 ($75 annual fee x 2 cards – $100 statement credit on personal card). Is Bank of America Cracking Down on the $100 Alaska Airlines Statement Credit? For a long time, it was easy to get approved for multiple Alaska Airlines cards in a day until Bank of America recently started cracking down on that. Even better was that you could usually find a direct link for the card that had a $100 statement credit so Bank of America would literally be paying you to acquire 25k Alaska Airline miles. The $100 statement credit offer was suppose to be for those who purchased an Alaska Airlines flight but it was possible to attempt a dummy booking and you would usually see the offer right before you would have to pay for the flight. It has come to my attention that that Bank of America might be cracking down on those who signed up for the card with the $100 statement credit without purchasing a flight as I know of at least one report now that Bank of America refused to issue the $100 statement credit. 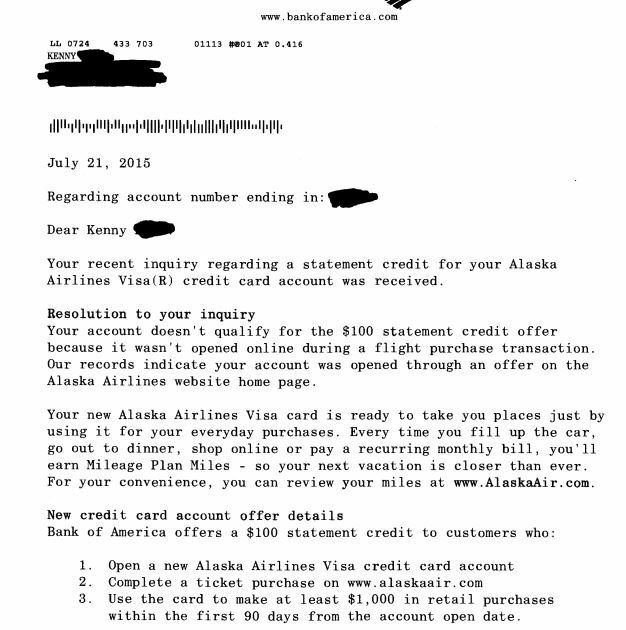 PointsCentric reader Kenny recently commented on this post how he was refused the $100 statement credit after spending $1,000 on the Alaska Airlines credit card. He disputed this with Bank of America who in turn sent him a letter officially denying him the $100 statement credit. Kenny has allowed me to share a snapshot of that letter below. This is the first I’ve heard about this so I don’t know yet if this is an outlier case or the new trend. 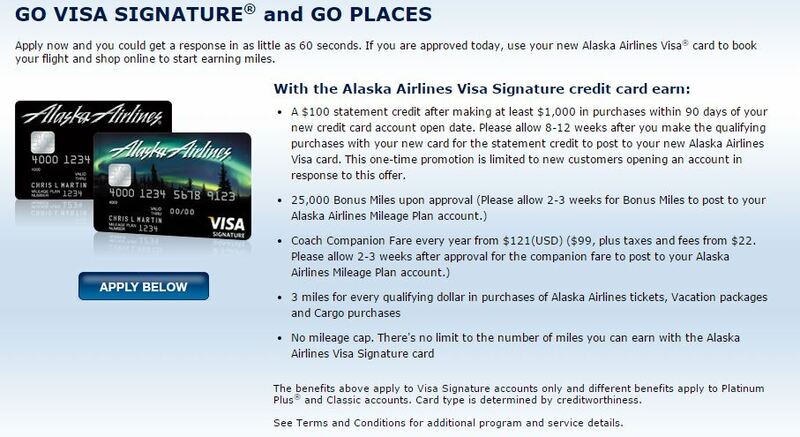 It could also be possible the reader thought he signed up via a link with the $100 statement credit but actually didn’t (it did say in the letter he signed up via the Alaska Airlines homepage). Personally I think that’s unlikely – it’s very obvious when you signup for the card whether there is a $100 statement credit or not. The timing of this is quite interesting as I recently got 2x Alaska cards with the $100 statement credit back in May. I met the $1,000 spend requirement on one card early in May and got my $100 statement credit. However for the other card I actually just met the spend requirement this past weekend. I will keep you updated if that $100 credit posts. Alaska Airlines must be providing BofA this information as BofA would not be able to tell if you actually purchased a flight. If this is indeed a new policy, does it impact any card that has not met the minimum spend yet? I should be able to determine this if the credit posts to my second card. Unless it does post and that leasd to this question – Does it affect cards that were applied for after a certain date? I need to ask the reader who shared this when he applied for the card. At the very least, there is now some risk you would be wasting a $1,000 of spend on this card. Since your return is about 10% (little less unless you spend exactly $1,000), I would still chance it for now until I see other reports confirming this. 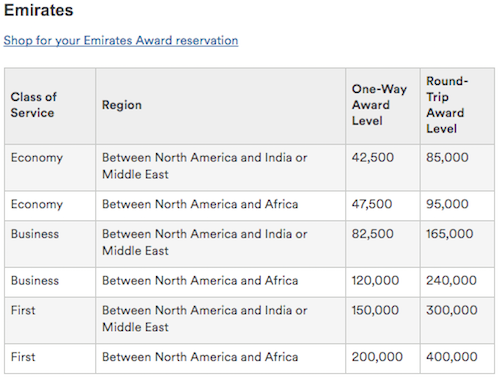 Lastly, even if the $100 statement credit never posts, I’d still be happy earning 25k Alaska miles for a $79 annual fee. Let this serve as a reminder that the Hobby (corrected link to the Rolling Stone Article) is always changing and evolving. What works today, may not work tomorrow. Last month, I posted how I found a way to generate the Alaska Airlines 25,000 miles + $100 statement credit offer when many had thought it was a goner. Then Maximizing Money one-upped me and found a direct link which made getting the offer easier and quicker. Since then a direct working link has come & gone several times and much ado is made when a working link returns. That’s nice and all but my PSA for today is that this offer is always available – working link or not. Let me remind you how. Last month, I stumbled across the offer while pretending to book a flight on AlaskaAir.com. Sometimes making a reservation, whether it be for a flight or hotel, can generate a better offer on the applicable credit card, as seen in the past with Hyatt and IHG. I tried to replicate this with Alaska Air and BAM, there was the offer on the payment page. 1. Go to AlaskaAir.com and start booking a flight. It doesn’t matter where but I’d chose somewhere fun. 2. 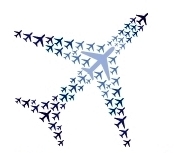 Choose the flights and start filling out the passenger info. 3. You can skip the seat selection and all those add-ons. You just want to get to the payment page – its not like you will be flying this anyway. 4. Scroll down to where you would enter your credit card and look to the right. BAM! 5. Click “Apply Now” (duh) and you’ll be brought to a page that looks like below. Voilà! While it is a nice to have a working link to save you the 30 seconds of getting the offer in the way I outlined above, please remember you can use this approach to get this offer on demand. Bank of America will undoubtedly pull this this current working link at some point so the next time you apply for one or two of these cards don’t fret if you don’t find a working link. 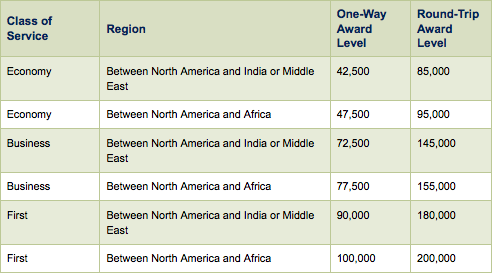 Bookmark this post as a reminder and let Bank of America pay you $25 to earn 25,000 miles.